Based at Hassop Station on the Monsal Trail, we hire a wide range of adult and kids cycles, along with eBikes, tandems and trailers. With bike hire from only £10 per bike you could soon be experiencing the unique Monsal Trail aboard one of our quality cycles. As we are based at Hassop Station on the Monsal Trail, why not enjoy a coffee and meal post ride? Proof of ID with photograph is required for each booking (e.g. new style driving licence, passport). ID will be held for the duration of the hire and will be returned once all bikes and equipment are returned undamaged. Payment can be made by cash credit/debit card.You will be supplied with a bike lock, please use it if leaving your bike unattended. Any loss or damage to our bikes or equipment will be the hirers responsibility and must be paid for. ID will be held until payment is made. Children under 16 must be accompanied by an adult. Do I need to book Cycle Hire? No, we don't operate a booking system due to the fact that we are all different shapes and sizes. You can book tandems, trikes and electric bikes in advance and large group bookings, but otherwise just turn up. We have loads of bikes and on the rare occasions we run out, there are always bikes coming back in which can then go out again. 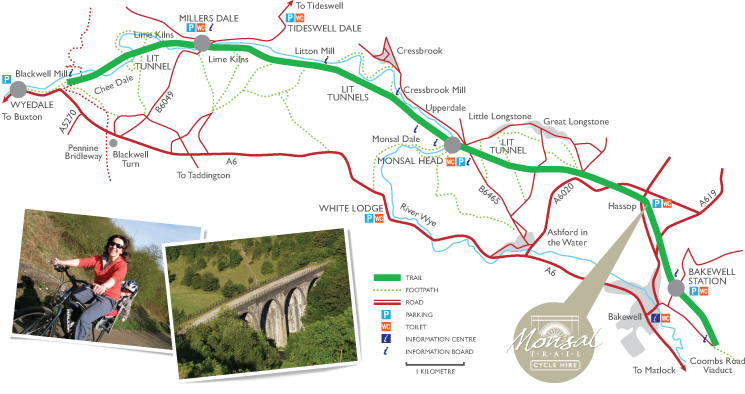 How long is the Monsal Trail and how long does it take to ride it? The trail is nearly 8 miles to the end from the hire centre. How long it takes is up to you. If you travel at a brisk pace to the end and back with limited stops to enjoy the view you can do it in under two hours. If you want to take your time, stop for photos or refreshments or to take a detour off the trail for example down in to Bakewell, you can take all day. We do 2hr, 4hr and all day hire. Can you fit a tag-a-long to anyone's bike ? No, only hire bikes for safety and insurance reasons. Can you fit a trailer/buggy to anyone's bike? Yes, but some bike types are not compatible so please be aware if your bike is not then you may need to hire one of ours. Can you fit my own attachments to your hire bikes? No, only our attachment can be fitted to our bikes for safety and insurance reasons. How old do the kids need to be before they can go out on the attachments? One year old minimum on all the attachments. How big does the child have to be to go on the tag-a-long? The child has to have at least 19” inside leg to ride the tag a long. Is there an age/size limit on the tag a long ? Approximately six years old is the maximum for the tag-a-long. We may judge the child to be too big for the tag-a-long if it compromises safety. Is there an age limit on the trailer ? Approximately seven years old is the maximum age for the trailer. What do you accept as a form of id ? Id can be anything with your name and photo on and can be any member of the hire group. If you only have a non-photo ID eg a bank card, we can accept that too. Can you fit attachments to electric bikes or tandems? What time would I need to arrive to make sure there are bikes left to hire ? At peak times such as weekends and school holidays if you can arrive before 10:30am, but if you arrive later in the day we always have hire returns coming in that can go out again. It is not compulsory but we strongly recommend you take one free of charge. What do I get with the hire ? Helmets,locks,and map included in the hire price. Cycle Service & RepairsWe don't just hire bikes, we fix them too! Alongside our bike hire facility we also offer a full cycle servicing & repair workshop, open 7 days a week, 362 days a year! Not sure what needs doing to your bike? Don't panic. Our CyTech qualified mechanics will be happy to inspect and advise accordingly. No job to big, or small. From puncture repairs to complete rebuilds. Including brake, gear and key component adjustments. wheel truing, general check and adjust (where possible) of all components. brakes plus replacement of inner cables. If this was you, great! If not, please reply to this email so we know to ignore it. Not got a reply from us? We normally respond to messages within a few hours during opening times. if you haven't heard back from us in this timeframe it's possible your message got lost.In this case please try again by emailing us directly on info@monsaltrail.co.uk. Hassop Station is the main cafe and outdoor area on the Monsal Trail. Opened in 2011 it encompasses a cafe, book shop, gift shop, cycle hire and bike shop.